Gemini Star Acrylic Awards. This star award is the perfect corporate gift for anyone! 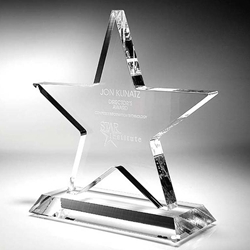 Award is available in clear 3/4" thick acrylic cut into a star shape with base at the bottom. Also available in your choice of 6", 7", or 8" sizes. Price includes your choice of laser engraving or full color imprint of your text on each item. We'll send you a proof prior to production. Item Size 6", 7", or 8"